Sarah Hanshaw prepares a shoebox Nov. 13 at At His Feet Christian Center for Operation Christmas Child. Vicki Hart, director of the shoebox drop-off for At His Feet Christian Center for Operation Christmas Child, oversees some of the 500 shoeboxes collected in just the first few days. MOUNT GILEAD — Reaching children around the world with the message of hope through Christ is the foundation of Operation Christmas Child. Local residents are assisting the cause, often referred to as The Shoebox Ministry, through At His Feet Christian Center. After just a couple of days, the drop-off center had more than 500 boxes. The church’s goal is to surpass last year’s count of 1,300 shoeboxes collected, packed and sent overseas. Sarah and Sydney Hanshaw were among a group of church members sorting and packing those boxes. Vicki Hart, director of the drop-offs at the church, was pleased. “We’re so thrilled to have the opportunity to go to a child. Once they receive that box then parents and community become involved … and sometimes a church pops up,” Hart said. Shoebox collections began 25 years ago. Since 1993, Samaritan’s Purse has partnered with local churches around the world to deliver 157 million Operation Christmas Child shoebox gifts to children in need in 160 countries. Each one — packed full of fun toys, school supplies and hygiene items by a family or individual — is sent with prayer that the child who receives it will experience God’s love through their simple gifts. 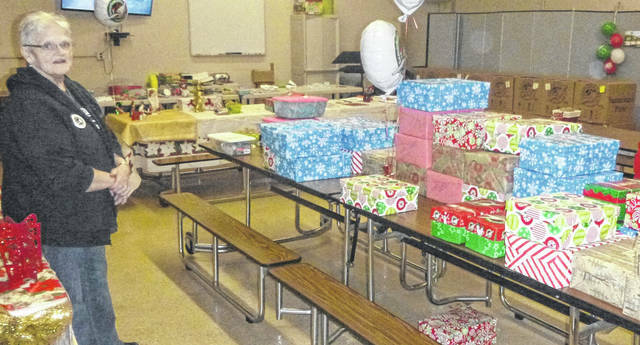 Woodell said Melissa Deems’ class at Cardington Elementary School will fill 75 shoeboxes. The shoeboxes are taken to Mansfield on Dec. 19. From there they are driven to a larger distribution facility and shipped to various countries. Hart believes the project comes directly from the book of Matthew. “Jesus’ command was to go make disciples of the world,” she said. Delivery of shoeboxes is 10 a.m. to 3 p.m. through Nov. 19 at the church, 257 Lee St., Mount Gilead.